Registration went live for the meeting in Manchester this week. One of the events we have scheduled is a Yarn Tasting. It should be lots of fun. StevenBe and Stephen West will host it. Participants will get a great goody bag plus lots of yarns to try. I am very excited about this event. I'm still struggling with my cold. The fact that it snows one day and is 70 degrees the next can't help! The updates to the Basics Class are coming along nicely. I should make my deadline of April 1st. I did get some lessons to review this week but not too many. I tried to time my reviews to times when I felt the most clear headed! This is another topic inspired by my updates to the Basics Class. I have a swatch where the student works yarnovers. The yarnovers in the swatch are worked between two stockinette stitches. This type of yarnover is simple. You just bring the yarn forward as if to purl, then you knit the next stitch. In a project you might have different types of stitches next to each other: You may need to work a yarnover between two purl stitches or a knit and a purl or a purl and a knit. Two Purl Stitches--There are two ways to make this yarnover. One produces a smaller yarnover which can be hard to see. To do this, purl the first stitch, bring the yarn to the back and over the right needle. Purl the next stitch. The second method produces a larger yarnover. Purl the first stitch. With the yarn in front, bring it over and completely around the right needle. Purl the next stitch. Purl and Knit-- Purl the first stitch. With the yarn in front, bring it forward over the needle. Knit the next stitch. Knit and Purl--Knit the first stitch. The procedure is the same as for making a yarnover between two purl stitches. There isn't much you can do wrong when making a yarnover other than not making it or wrapping the yarn around the needle several times. Knitters new to lace sometimes make a very common mistake. I discovered this when I wrote a pattern for a simple hand towel and several knitters had difficulty with it. They complained that they ran out of stitches before they could complete the row. It took me quite a while to figure out what they were doing. A yarnover is made BETWEEN stitches. What they were doing was assuming that a yarnover consisted of two things....making the yarnover and then knitting the next stitch. They didn't realize that the yarnover was just one thing. This is a fairly common mistake. I am still not 100% but I don't think I am contagious anymore so I will have salon on Saturday from 2-4:30. By the way, the next opera is on April 5th and it is La Boheme. If you have ever wanted to see an opera, this is the one to see. The Zeffirelli production is lovely and the cast looks (and sounds) fantastic. Also, for an opera, it is on the short side. It was a very productive week. I finished the Fleur-de-lis Hats and Mittens and the pattern. I also finished the knitting for the baby & kids argyle vests. They are blocking. Since the yarn is superwash I didn't take that much trouble. I mainly wanted to smooth out the diamonds. Unlike the adult versions, I am going to duplicate stitch the cross hatching. The color is off. This looks like robin egg blue. It is a deeper shade. The samples are sizes 9-12 months & 4T. The pattern goes up to Size 10. I've done the gauge swatch and started the Wasp Wing tunic. I'm using Shibui Linen which I love. The warmer weather and then the snow the next day brought me an unexpected gift...a spring cold. Actually, I probably caught it at my piano lesson. That is what I get for hanging out at a place where there are kids waiting. Colds make me stupid so I hope this blog makes sense. Not many lessons arrived for review which was a good thing. I can't say that I am at my best! I still am on track for having the Basics course revised by April 1st. I am not making major changes. I am just adding links to this blog so students don't have to search for them and clarifying a few things. Any student who has taken the class while I have been teaching it can request a copy by email. I just need your names. Wait until April, however, as it is well known my record keeping skills leave much to be desired. Last week the tip was about the standard long tail cast on. If you aren't familiar with that cast on you may want to check out that post first before proceeding. This is a variant of that cast on which produces a bumpy edge on. Why would you ever want to use this? Think about ribbing where you have knit and purl stitches next to each other. Most knitters prefer to have the smooth side of the cast on for knit stitches and the bumpy side for purl stitches. This variant allows you to accomplish this. The next two photos show ribbing where the long tail cast was used. There is a question in the Basics class which asks the students to indicate which side they prefer. The majority prefer that the smooth side be used. When the bumpy side is selected there is a purl stitch below the knit stitch which is a bit distracting to many. This photo shows the result of this variant used for the entire cast on. To use this in ribbing you would alternate the long tail cast on with the variant. This photograph shows K2P2 ribbing where this has been done. There will not be a salon this weekend. I like my friends too much to expose them to this cold. I'm not up to completely disinfecting the house quite yet. The extra yarn arrived from Blue Sky Alpaca. They have been FABULOUS. I screwed up and didn't completely think through how much yarn I needed. They were so gracious in sending extra yarn. The yarn is perfect for this project. I should have finished all of them but I took the gray hat apart several times to get it just right. The same thing happened with the first mitten. I am glad I had the time to get them just the way I wanted them. I am doing lots of videos for them as the pattern will have links to them. The magazine should be digital by the next issue if everything goes to plan. I obviously did the videos with the purple colorway. I have the linen yarn from Shibui to do the wasp wing tunic and the yarn for the Baby and Boy sized argyle vests from KnitPicks. I was waiting for yarn to to the Confident Beginner Design (a new feature for the magazine). The company (who shall remain nameless) who handles the yarn never got back to us and so when the managing editor called yesterday she found out that they select who they will allow to use their yarns. If the managing editor hadn't followed up on this, I'd be waiting for the yarn forever. Needless to say, I will NEVER use that yarn in any project I ever design. This is the first time I've heard of a company saying something like that. Oh well, I selected a FAR better yarn from Juniper Moon Farm who were delighted to ship it off today. Thank you! We are doing a lot of alpaca in the fall issue as the photo shoot is at an alpaca farm. The yarn has started arriving for the Cast On garments and one of my New Year's Resolutions is to start projects right away. I am also making videos about the projects. Cast On is scheduled to go digital for the Summer issue and we plan to have links to educational information. All of my projects will have videos attached so you can see how to do various things. I am quite excited about this. My other project this week was to start revisions on the Basics Course. The last time I revised it was before I started this blog. I am putting in links to entries on specific topics in the reference materials which will make it easier for my students. I am shooting for April 1st as the day it is ready. If you have ever taken the course, I will be happy to email you the new materials. Just send me your name so I can check my records and I will ship it off. The contents will remain the same. An important thing to know about this cast on is that it provides the first row of stitches as you work it. When you are following a pattern, it can be important to know that. Depending on the pattern, you may have already worked Row 1 when you cast on. The other important thing to know about this cast on is that one side is smooth and the other side is bumpy. If you like the smooth side on the RS of the work, the first row you work should be worked as a WS row. The next two photographs show this approach. The other approach is to work the first row after the cast on as a RS row. This will place the bumpy side of the cast on on the RS. The next two photographs show this approach. Is there a right way or wrong way to this decision. No. It is a matter of personal preference. I must say that the majority of my Basics students prefer the smooth side for the RS. The important things is that the knitter is consistent. If you use the smooth side for one sleeve or for the front, make sure you do the same for the other sleeve or back. There are may different cast on techniques and next week I will show a variant of the long tail that produces purl bumps on the RS as you cast on. 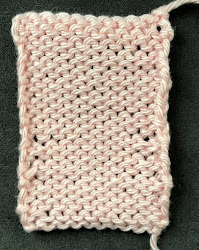 This is useful for ribbing where you may want the smooth side for the knit stitches and the bumpy stitches for the purls. Salon will be on Sunday from 2-4pm. Saturday the Met is doing Werther. I finished my socks before the Blue Sky yarn arrived. They look green in this photo but the yarn is quite turquoise. I took apart the pink socks I had started for Cynthia and used the Bow pattern for me. I had to put them aside due to my resolution. It is very unlike me to have partially completed projects around. I selected Blue Sky Alpaca (sports weight) for a hat and mitten set. The stitch pattern for the fall issue is slip stitch patterns. When I was researching slip stitch patterns for Level 3 of the Masters Program I fell in love with a pattern I found in an old Mon Tricot stitch dictionary. I didn't use it for Level 3 as it is a MINDLESS EASY pattern and I probably wanted to show off a bit. This is the first time I've used it in a design. The hat will have a wide band with buttons. The cuffs on the mittens will be longer and both will have buttons. As I wrote up the proposal, I thought showing two colorways would be fun....one subtle and the other not so subtle. Since the pattern is Fleur de Lis, I selected a variant of Mardi Gras colors. I've finished the bands and cuffs for the subtle colors and am starting on the other now. I should have them finished by next week. We had a "winter" event here on Sunday night which pretty much shut everything down. Since I couldn't get out of my driveway immediately we had the Cast On selection meeting a day later. They didn't get as much snow in Ohio as we did here in Kentucky. The good news is that my new hip seems to be working fine. I was able to shovel snow with no bad results (except for sore muscles...I haven't been able to exercise since September!) The 9 hour drive was much more painful. Mail was delivered despite the weather so I did get several lessons to review. I continue to be amazed at how fast mail comes from Europe. I received a lesson from a student who just ordered the a few weeks ago. I've noticed the slowest mail service is from Canada. It is astounding how long it takes. Last week the tip discussed the jogless join. This is something tested in Level 1 of the Masters Program where a mitten with several stripes is submitted. Many knitters have trouble with this. It isn't the jogless join that causes the problem but rather how the yarn tails are woven in. If it isn't done properly, the join isn't jogless or there are overlarge or twisted stitches. This is what jogless joins look like before the yarn tails are woven in. Notice the overlarge stitches. The first step is to turn the piece inside out and use a tapestry needle to work the excess yarn out of the large stitches. The second step is to look at the RS again and make sure the stitches look even. (This is the step I think many knitters skip. They just start weaving in the tails.) Unless you look at the RS, you do not know if the stitches look correct and blend in with the surrounding stitches. Next the tails are woven in using the duplicate stitch method. As you weave in the tails, make sure to check the RS often to ensure that the stitches do not get twisted or distorted. This photograph shows the WS of a swatch with a jogless join. I have discussed how to do this MANY times in this blog. Check the index for posts on this topic. This video shows how to weave in the tails of a jogless join specifically. Weaving in Yarn Tails for a Jogless Join. Salon will be on Sunday (March 9) from 1:30-3:20). I offered to make a baby hat for a friend to give as a gift. I almost forgot that I had made this promise. It only took a few hours even though the rosebuds gave me fits. The first set were too big and looked silly. These are much smaller. I love this design for a baby hat. The baby can wear it for a long time as the brim can roll down and the stockinette is so stretchy. I finished Cynthia's socks. They go in the mail today. The yarn is a wool/cotton blend.